alaTest zebrał i przeanalizował 1774 opinii użytkowników z magazynów i stron. Ludziom podoba się wygląd i rozmiar. Przenośność jest również bardzo dobra ale niektórzy mają wątpliwości co do zestawu złącz. Eksperci oceniają ten produkt na 69/100 a użytkownicy na 85/100. Przeanalizowaliśmy te oceny, wiek produktu i inne czynniki. W porównaniu do innych produktów z kategorii Kamery wideo, Polaroid Cube uzyskał ogólny alaScore™ 92/100 = jakość Celująca. Polaroid's Cube isn't as tough as a GoPro or as high-quality as a handheld cam, but at $99, the easy-to-use action cam makes a novel way to shoot from new perspectives. With beefed-up video and photo features and the ability to wirelessly control it with your smartphone, this Cube is roundly better than its predecessor. Video and photo quality, though better than the original Cube, is still just OK, best suited for viewing at small sizes, such as on a smartphone. Integrated battery means you'll have to recharge or connect to a power source to keep shooting. The Polaroid Cube+ keeps all the good stuff from the original Cube -- namely its design, simple operation and reasonable price -- but the added wireless definitely makes it a better camera worthy of the extra cost. The tiny Polaroid Cube is an excellent choice as a bargain-priced action cam, offering no frills, but surprisingly good video. Good video quality. Tiny. Inexpensive. Simple to use. Rugged. Relatively narrow field of view for an action cam. Low-res still images. Limited video resolution choices. The eye-catching Polaroid Cube is an inexpensive 1080p video camera that's small and light enough to be your constant companion. The Polaroid Cube is an ultrasmall and lightweight action cam for catching life's little moments on the fly. It can be used for capturing HD-resolution video, snapping photos, and as a dashboard cam. The only mount included is its built-in magnet. No microSD card is included for storage. Video quality is just OK considering the price. Video is split into 5-minute clips while recording. 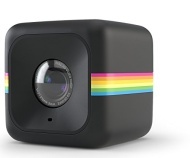 The eye-catching Polaroid Cube is an inexpensive 1080p action cam with video quality that takes a backseat to design. One button operation makes the camera incredibly easy to use. Video image quality is very good for an affordable action camera. Very simple to change camera settings. It might be indelibly linked to instant cameras and film, but the Polaroid brand has long been seen on other products like tablets, televisions, headphones, and, yes, action cams such as the XS100i .